Finally made the Friday sketchers challenge again. 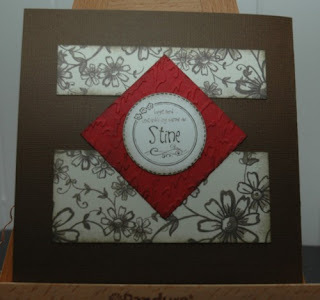 Think this is my first card this year as I have been busy trying to do layouts. Card for a good friend who turns 33 next week. 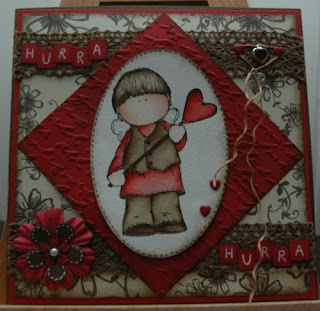 Have used patterned paper from Websters pages, ribbon/lace from Panduro, stamp from Hänglar & stänglar, and cuttlebug embossing folder script. 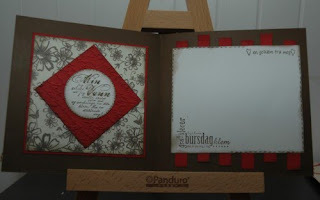 Have also used the sketch for the inside and backside of the card. Inside I use a stamp about friendship from he norwegian designer Stempelglede. And on the backside one of my personal stamps from Scrapmagasinet!